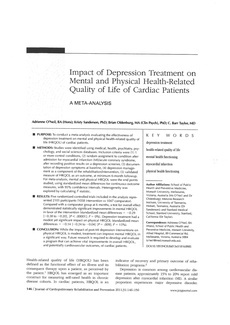 PURPOSE: To conduct a meta-analysis evaluating the effectiveness of depression treatment on mental and physical health-related quality of life (HRQOL) of cardiac patients. �¡ METHODS: Studies were identified using medical, health, psychiatry, psychology, and social sciences databases. Inclusion criteria were (1) 1 or more control conditions, (2) random assignment to condition after admission for myocardial infarction (MI)(acute coronary syndrome, after recording positive results on a depression screener, (3) documentation of depression symptoms at baseline, (4) depression management as a component of the rehabilitation/intervention, (5) validated measure of HRQOL as an outcome, at minimum 6-month followup. For meta-analysis, mental and physical HRQOL were the end points studied, using standardized mean differences for continuous outcome measures, with 95% confidence intervals. Heterogeneity was explored by calculating I2 statistic. �¡ RESULTS: Five randomized controlled trials included in the analysis represented 2105 participants (1058 intervention vs 1047 comparator). Compared with a comparator group at 6 months, a test for overall effect demonstrated statistically significant improvements in mental HRQOL in favor of the intervention (standardized mean differences  0.29 [0.38 to 0.20], [P  .00001]; I2 0%). Depression treatment had a modest yet significant impact on physical HRQOL ( standardized mean differences  0.14 [0.24 to 0.04] [P  .009]; I2 15%). �¡ CONCLUSION: While the impact of post-MI depression interventions on physical HRQOL is modest, treatment can improve mental HRQOL in a significant way. Future research is required to develop and evaluate a program that can achieve vital improvements in overall HRQOL, and potentially cardiovascular outcomes, of cardiac patients.